Yes. It really is one of the best RPGs for all the reasons stated, which I cannot reiterate enough. And in the months since finishing it, I’m still having a hard time trying to wrap my head around Suikoden II. If I had to sum up the game in a word, it’d be “deceptive”. There are rope climbing mini-games, produce and animal farms to tend, pier fishing with salmon in its ocean that remain free of my line and free of my pot in Iron Chef style Cook-Off battles. There are 108 stars of destiny whose lives are fascinating, others ordinary; but together their stories flow naturally with many carrying importance, regardless of how small their contributions are to the overall narrative. There’s a slow burn to Suikoden II. Except that’s not quite it either. Like a well-written drama, there’s so much going on that it’s masterful in how it presents information, and characterizes its players. Scenes unfold with expert delivery — deliberate, methodical. In a game with kobolds, elves and magic runes, they are mere parts of a complex and engaging but otherwise normal and believable story. This balance between reality and fantasy is magnificent, and it’s just the sort of wonder I’ve been missing from my JRPGs as of late. The world of Suikoden is vast. Unlike many JRPGs that offer stand-alone stories, the first installment laid the groundwork for a tale involving runes imbued with varying types of abilities, and the effects on those wielding them. Each of the 27 true runes are not all accounted for in Suikoden, not even by the time Suikoden II picks up from where the first story ends, or even at the end of Suikoden II. Aside from the background of the runes, the tales in Suikoden stretch across various continents in the same universe allowing for multiple events to occur across the series, often parallel with current in-game events. It’s very much like watching history unfold, with events of one game affecting areas and people years later within the timeline, which in turn, have an impact on future installments of the series. By doing so, it also creates interest as to the fates of key characters, something I was not expecting when I started the second game. Some characters from the first appeared and I was pleasantly surprised that they were even there—more so when I discovered that some held expanded roles, and not merely cameos. I’ve played only the first two games, and cleverly Suikoden II drops hints of unrest in other areas of the world. Already I’m eagerly awaiting a chance to play Suikoden III, wondering just who might show up, how much the world has changed, or which area is waiting to add even more intrigue to an already dense universe. It may be hard to keep track of it all—all these histories coming into play but the potential and diversity is staggering. Yet, Suikoden II deftly manages all these rumblings on what’s to come and never sacrifices on the quality of its own well-developed, stand-alone and incredible story on friendship strained during one man’s rise to murderous power, while under the threat of war. He may not have that certain flair that many JRPG villains have, from your Final Fantasy series for example, where clothes and appearance dazzle and detract from nefarious plots. What Suikoden II’s Luca Blight has though is conviction, and determination. He’s truly mad with power, ambitions and evil. Destroying the world is one thing—that’s the sort of global destruction that villains tend to do from afar. Like Final Fantasy VII’s Sephiroth trapped in a crater surrounded by a shield and pulling strings by sending copies of himself on gopher errands. Or Chrono Trigger’s Lavos threatening mankind across time, buried deep in the earth and draining its life force. It’s also not uncommon to get to know some of these villains as well as what motivates their intentions. Or experience insight into their tragic back-stories, or even feel a little bit sympathetic towards them. It’s not uncommon for many JRPG villains to feel untouchable, distant threats, as with the aforementioned villains, respectively. But then you have Luca Blight, who does not shirk his evil work, instead hand-delivering death and instilling fear on a personal level. His reputation precedes him and villagers cower knowing their time is coming—that one day Luca Blight would ride into town and it’d be over. That’s a fear that you can taste. His scenes are shocking, reprehensible and ruthless. ...But so too are some of your characters. War forces hard decisions, and not necessarily the ones that are upstanding. Some are born of necessity and there are things that a few of your characters will do that are shocking. One of your strategists, Shu, is an excellent example of this determination and some of his actions are as disturbing as Luca’s. Shu’s role is to secure victories. To a player, one of his decisions in the course of the game may feel reprehensible as well in comparison. However, one of Suikoden II’s best assets is the maturity at which these characters are written. Shu is self-aware, accepting of his role, strengths and flaws as a person. This can be said of some of the more developed party members too. Not all carry that assured nature and some journey with your main character on their own paths to growth. It’s moments like Shu’s particular decision later in the game that make Suikoden II feel ever evolving, ruthless, realistic and genuinely surprising. Characters carry these black marks with them but bear them with full responsibility. They tend to not dwell on what could be for too long, and instead move forward on what they have to do. That may not be an uncommon JRPG trope but even some of the tougher, aloof JRPG characters will have a long, drawn out story to humanize them. Suikoden II understands the war it created, and it understands that sometimes there’s no time for regrets under certain circumstances, and that it takes a vicious character like Shu to get things done. It greys the distinction between vile and just, makes no excuses and while it may leave you with a bad taste in your mouth, it will still have you convinced that the necessary course of action was taken. Suikoden II is one of those experiences that has become more complex as I ponder its secrets, and the enraptured nature of its storytelling. I did not realize just how invested I was until late in the game when I was locked in an ever stressful army battle, and heard one of the greatest pieces of music I’ve encountered. Like any good soundtrack, Suikoden II’s manages to tug at heartstrings, be tense when necessary and speaks for its characters. Although the music did not draw me in immediately as many of the compositions of the Final Fantasy series, Chrono Trigger or Chrono Cross have; it should not be so easily dismissed either. There are many tracks that are beyond outstanding, with those pieces telling parts to various complicated stories and emotions intertwined in Suikoden II’s deep narrative. Take “Kyaro’s Theme” for instance. I didn’t have time to get acquainted with its soft melody, or be beckoned with its quiet home town charm when I heard it in a fleeting moment at the beginning of the game. I was fortunate to hear it again at the end of the journey and it was only then I realized that I had longed for its nestling sounds. That’s the depth of Suikoden II. Choices are meaningful, giving weight to the importance of songs while songs in turn give weight to the meaningful choices made. It’s a symbiotic relationship, carefully crafted and indescribably poignant at times. One of JRPGs’ strengths come from the small ragtag band of characters many of them feature. It’s this small group of 5 to 8 characters which makes a JRPG journey of saving the world a personal investment. Players are usually able to enjoy or identify with specific traits or smaller stories tied to a cast of characters because there’s usually enough individual attention given to each for fleshed out development. Supporting cast members are not always reduced to stereotypes, and some may outshine even their leads such as Balthier—the self-proclaimed leading man of Final Fantasy XII. What’s great about smaller casts in JRPGs is the focus, and just how manageable their interpersonal relationships are handled, provided they are written well to be relatable. Suikoden II throws 108 recruitable characters at you. This plants the game in a predicament by being the complete reversal of allowing each character a chance to grow. Some will become your merry companions with their personal histories explored but the large cast means that you may find others in a cave, town or else where who will join your crew based solely on your strength. There’s not much to become familiarized with for some, or reasons to deeply care about them. And so Suikoden II does something clever and makes a mini-sidequest of it. You can examine many of them within the course of the game through bits of snooping via your very own detective, should you recruit him. But even so, when you meet the 108 stars of destiny, their introductions are not without a little bit of fanfare and their characters are not without some quirks that separate each of them from one another. For the ones that are playable, their attacks in battle are designed with their personalities in mind, and the roles they fulfil in the game. Others can work together in battle, and their relationships allow for combined special attacks that are a whole lot of fun to execute and watch. Others receive sidequests that expand gameplay fun, such as the Castle Chef’s Iron Chef Style Cook-Off or the artist who will make a marbled guardian deity for your Castle. It’s these little things that make Suikoden II feel highly customizable, and make you as the player feel invested in the strength of your army. It’s that strength that reveals something really inspired about Suidoken II’s cast management. 108 recruitable characters is extensive. While some may not have as expanded a role as your main members, they each matter to one of the game’s unique features — castle ownership. It could end there: your characters get a castle to camp out at for sleeping and recovery purposes only. But in Suikoden’s universe, strategic locations within warring nations is important not only for standard war effort benefits but for the overall narrative as well. Factions join your fight, important shop owners with specialized skills (such as a smithy or rune master) may as well, and your castle expands as the story unfolds and members are recruited. It starts to feel like a home—A well-oiled machine of a home. NPCs and recruitable characters alike take up residence and their worth becomes more ingrained as functioning members who contribute to the health of a successful army. It’s a unique experience building this camaraderie. Within the castle walls and gate is bustling activity of happiness and hope, aided by the cheery sounds of its theme music. At night and before major battles and events, that sense of uneasiness fills the dimly lit candle rooms of your war strategists and generals. Guards block various pathways for your protection. The curfew feels a necessary restriction in the context of the game. You’re forced to go rest at times by concerned members of your castle. It’s excruciating and nerve-wracking. Games will do this at times before giant event changing scenes or boss battles. It’s not an uncommon element to JRPGs, usually at one or two pivotal points in any given narrative. Suikoden II does it often—with a journeyman’s save crystal glowing just outside your war council room as that reminder to save before directing your army’s fate, and before taking off on dangerous ventures—because there’s always a huge mission at stake. That particular journeyman’s crystal saved more lives than any other. It was the most welcome, as well as the most feared. Sometimes, members from your band of 108 star characters die or will be missed as recruits due to your carelessness. cast. The best ending is something that could be easily missed, or in one particular case, frantically achieved from the fear and desperation of a life-saving button mashing fest. Other times, they’ll vanish due to a timed event leaving sidequests unfulfilled. Or they’ll be in places where you’d have to trigger their interactions by searching everywhere. Gaining some of the characters are like sidequests in of themselves, requiring certain items and a little bit of detective work. Key battles sway outcomes and fates of some others as well. Not every loss falls to a pre-determined scenario. There are games like Fire Emblem: Awakening where permadeath options make all your choices matter. The option to set this standard control on your game is there from the beginning which forces critical thinking, and mentally prepares you to act accordingly. It’s the same with Suikoden II except these battle choices are not dictated from the start as an option you can switch on or off. It leaves the game open for a lot of screw ups—Some you probably wouldn’t even realize. 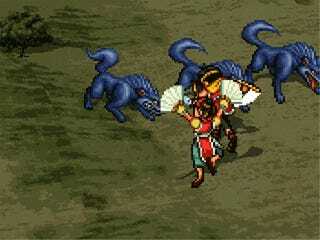 There’s a real intensity to some of the harder army battles in Suikoden II too. Acts of war bring expected casualties. So while hundreds of your tiny sprites can fall, losing main campaign members feel equally as harshly realistic or worse. Their deaths often come as the trials and tribulations of war, not just parts of the third person main story where a “Game Over” screen readily takes you back to the “Try Again” screen (though Suikoden II has those too). You don’t get those chances in Suikoden II’s war battles. If you lose a character, that’s it. Stories would still move forward. Scripts would slightly change. While it’s true there are some characters that you are unable to lose permanently due to their importance to a set narrative, the risks of losing others gives the game an additional layer of stress. Particularly near the end of the game where a couple of huge decision making events will change the outcome of your playthrough. It’s here that Suikoden II creates a bit of an illusion where it doesn’t feel linear. It continues this trend with players constantly questioning their every action and dialogue choices. Few JRPGs of its time that I played gave me choices that actually mattered to affect the story due to their close ties to a scripted narrative. There’s nothing wrong with this approach for, again, I’m a believer in the stories that JRPGs have to tell—viewing them as novels with set paths—but Suikoden II’s nuanced alterations in its story and conversations are intriguing, even in today’s landscape. Personas 3 and 4 adopt a similar technique through posing morality questions to players, the answers to which dictate the ending players achieve. These moments and the questions themselves are sometimes obvious as to morally sound versus morally corrupt—something Suikoden II is able to mask a little bit better if only due to the fact that the outcomes to your answers are slightly more difficult to predict. The questions themselves are not as clear cut either. And that just takes us back to that word I can’t help but think of when thinking of Suikoden II. In Final Fantasy VI there’s this heart-breaking moment that doesn’t have to be. Cid’s fate can be changed, and it’s not that obvious. Chances are he’ll suffer for those actions on someone’s first playthrough, but once the truth to saving him is revealed (or if you actually managed to do it the first time), his recovery may have less of an emotional impact on the player. In Suikoden II, there are a couple of moments where things can go awry too but these moments continue throughout at different junctions and characters aren’t quick to move on. Some of these moments are less of a one hit gut punch like Cid’s scene in FFVI but are ongoing pressures your party members face, which makes Suikoden II feel tense and left me with fearful uncertainty as I played. Depending on your decisions—and in the context of the game, these are very real, not black and white decisions that are easy to succumb to without guilt or without feeling a need to commit to a sense of duty or morally accepted choices—the story can branch in a couple of ways. It’s all so cleverly ingrained into the very soul of the game that it’s truly astounding, more so for how understated a simple touch of a button of a perfectly logical answer on your part can change everything. Suikoden II goes quite the way to divert your attention. Your three main characters change so much during the course of its journey. We’re not clued in to the type of life our heroes had until later on and at different points of the game. We’re dropped in the middle of the war, where we’re greeted with two young boys in an army camp, restless and eager to return to a simpler life. We have no real indication as to what they’ve already seen of the world or that they are jaded, but we’re led to believe that it’s not been easy either. The catastrophic event that triggers their extreme evolution and changes their ideals happens moments after we meet these children. They experience a conspiracy. They change undoubtedly from these events—more so than what we’re met with as players at the start of the journey—and it’s a downward spiral from there. But it’s not hard to imagine that their character growth began before the one major opening event—already in the situation that is war where transitioning already began; seeds already planted while being a part of something beyond normalcy. It’s stated on a few occasions that your protagonist’s eyes changed to become older given the role he’s thrust into as commander of an army at his age. Though if not for the event, would the main characters really have escaped suffering? They were already changed, and the event just sent them further along a different path of an inevitable war—one in which they could manipulate and contribute to its outcome. This is what makes Suikoden II deceptive. It’s carefully crafted for heavy characterizations that keep growing and developing but it’s unsatisfied to hand you a predictable narrative. There are twists. There are expectations that are swiftly destroyed. It pulls no punches and hits you hard with its tragedies by testing you with hard questions to which there are no correct answers. It’s not just a story being told, particularly when your decisions impact how your army moves and how the decisions impact your character’s relationships to those closest to him. Suikoden II seems straight and narrow for a while but as time moves forward in the game, it trickles in so many factors from your story to everyone else’s and piles them up into one complicated journey. The kind that left me incredibly impressed, and the sort of great storytelling that so many games could only hope to achieve. 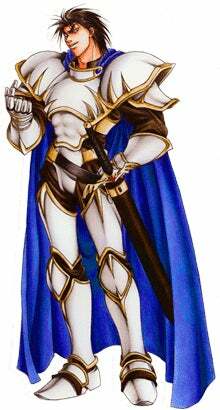 Suikoden II has ruined JRPGs for me in a strange way that strengthens my bonds to the genre. It sets a high bar for this player, whose eyes have become accustomed to expect certain things. It’s probably going to make me more critical of everything I play now, while reminding me why I fell in love with the genre to begin with—that when handled with care, JRPGs are capable of creating unique experiences through intricate narratives and layered characters. JRPGs can’t all be Suikoden II, and that’s okay. Though I do wish some of them would take a page or two from its absolute brilliance.